This full-length double portrait shows the Stephen twins, Alice and Sarah (known as Saidee) at about 19 years of age. The girls wear matching outfits and are shown standing side by side, their bodies turned toward each other in a front facing pose, in a studio interior with a prop table and curtain drape behind. The Stephen family are known to have frequented the George Street studio of Edwin Dalton, the most expensive photographer in Sydney at the time, and regarded by Lady Stephen as the best. This carte de visite portrait bears the stamp of Dalton’s Royal Photographic Establishment. 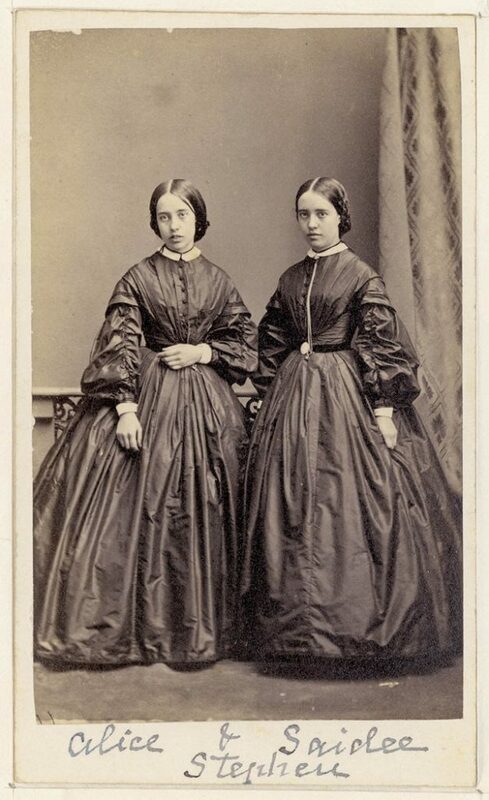 The twins wear identical day dresses constructed in a plain dark [silk taffeta] with very high necklines worn with narrow white collars, above pleated jacket bodices with self-covered button front fastenings and dropped shoulder lines, fitted around the upper arms with tight, pointed caps trimmed with two rows of narrow black braid, above plain, full skirts pleated into round waist bands, marked by contrasting dark [velvet] belts, worn over the necessary underpinnings of hooped cage-crinoline with several layers petticoats to conceal the wires. The girls also wear black [velvet] ribbons around their necks – perhaps suspending a locket or pendant – and long gold watch chains with fobs and winders – Saidee’s watch has clearly been tucked into the waistband of her dress. The other defining feature of the twins’ dresses is their large full ‘bishop’ sleeves, with a line of shirring along their length and worn with narrow white cuffs. Seen in fashion plates from 1857, the bishop sleeve was cut in a curved ‘bent elbow’ shape, pleated into the armhole and gathered tightly into the wrist. Reaching its greatest width and popularity by about 1862, it persisted far into the decade. Expensively, if plainly, clothed the twins’ readiness to enter society is clearly signalled by the dressing of their dark hair in the customary adult style, neatly and smoothly centre-parted and plaited into thick braids wrapped over their ears and pinned behind at the nape of their necks. As the girls are not strictly dressed for mourning, it’s possible that commissioning of this portrait marking the girls’ passage to adulthood at 18, may have been delayed until after the family’s official bereavement period (of a year and a day) following the death of their eldest sister ‘Nelly’ (Eleanor Elizabeth Stephen) on 7 February 1861. Alice Mary Stephen (1844-1902) and Sarah (aka Saidee) Consett Stephen (1844-1934) were the twin daughters of Sir Alfred Stephen (1802-1894), legislator and third Chief Justice of NSW, and his second wife, Lady Eleanor, nee Bedford (1810–1886), Born on 18 Feb 1844, Alice and Saidee were the eleventh and twelfth of Sir Alfred’s eighteen children, and the fourth and fifth of nine children born to Eleanor Stephen; the arrival of Alice and Saidee was followed by the birth of twin boys in 1847, one of whom did not survive. The Stephens twins, neither of whom married, were almost indistinguishable from each other. Doing most things in common and inseparable companions, they were described by their maternal grandmother, Mrs Bedford, as ‘bright sensible girls’ who cared not for frivolity. In their busy and crowded household, Lady Stephen oversaw the girls’ education at home, employing the services of a superior governess and following a strict curriculum, supervising their music practice before breakfast, and escorting them to dancing lessons and extra language lessons several mornings a week. In 1866, the Stephens moved to ‘Orielton’, a large, elegant and comfortable house with harbour views at Ocean St, Woollahra. As their father’s ‘home daughters’, following the death of their mother in 1886, the twin sisters were both enthusiastic musicians. Saidee was also a gifted linguist, able to speak five languages fluently; for many years in the earlier part of her life she had also acted as confidential secretary to her father, handling all his correspondence and assisting him in his legal work. After the death of Alice in 1902, Saidee lived on for thirty more years at her Woollahra home until her passing, at 90 years of age, in 1934. Painter, photographer and lithographer, Edwin Dalton had spent some time in America before coming to Australia in the 1853, possibly in search of gold. He set up as portrait painter in Melbourne. In early 1854 Dalton was living in Upper Hawthorn (Vic.) but by July 1854, he was in Sydney, where he attracted commissions from the city’s most prominent families. He advertised his Dalton’s Collodion Portraits at 243 George Street (1855-57), and his studio known as the Royal Photographic Portrait Establishment Gallery at 400 George Street (1858-59) with William Bradley, proprietor, followed by the Royal Photographic Gallery at 320 George (1863-65), and later at 330 George Street (1866-67), taken over by H. Hunt, as proprietor. The carte de visite is a stiff card of about 10 x 6.4 cm, with an attached paper photograph, invented in 1854 by André-Adolphe-Eugène Disderi. They were introduced into Australia in 1859 by William Blackwood with albums arriving in 1860, aiding the collection and distribution of multiple cartes. Cartes were usually portraits and were made by the millions worldwide. Multi-lens, or ‘multiplying’ cameras were introduced in the 1860s, which were capable of producing from 2 to 32 images in quick succession, dramatically increasing the number of cartes de visite that could be made from a single photographic plate. They were easily reproduced by making paper contact prints from the glass plates, which were then cut and pasted to card.